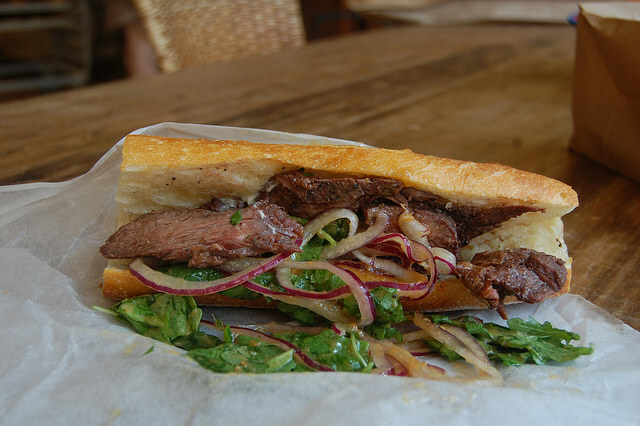 Sandwich which is made with beef steak and bread loaf is called steak sandwich, the steak is precooked (seared, barbecued or grilled) and the bread loaf can be of any of your choice, in addition to this toppings and spreads are used to create an eye appeal and enhance the taste. Some common toppings are olives, cheese, tomatoes, onions, mushrooms, ham, bell peppers, lettuce, mustard, mayonnaise, etc. Wash and dry the steak with grease-proof paper, then flatten it to a thickness of about ½ inch with mallet or with the base of a pan, this will tenderize the steak. And if the steak is refrigerated, thaw it before cooking. Preheat the oven 110 degree Celsius (225 degree Fahrenheit) bake the bread loaf for 2-3 minutes or as per the packet instruction. Remove the bread from the oven and keep it warm. Brush the pan with little olive oil and add the steak to the pan, cook it for 1 minute on each side for rare or 2-3 minutes on each side for medium to well-done steak. Transfer the steak to a plate and let it relax if for about 2-3 minutes turning it at regular interval so that it is coated in its own juices, this will make the steak tender. Split the load into half lengthwise and spread the bottom halve with olive paste and mustard if you like. Slice and oven roast the tomatoes and cover it over mustard and olive paste. Toss the rocket lettuce with lemon juice and pepper and top it over the steak cover it with the other half of the bread and serve hot on the bed of tossed rocket lettuce. You can also add caramelized onion roundels along with tomatoes or instead on tomatoes. You can to the steak with cheese slice or grated cheese. Mayonnaise can be used for the spread. Infuse rosemary or thyme will olive oil for extra flavors.